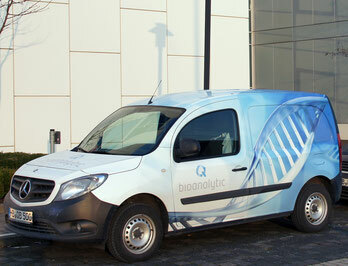 Q-Bioanalytic GmbH was established in 2003 by Dr. Oberheitmann and Prof. Dr. Harms. It is specialized in the analysis of pathogenic organisms in food or feed, with microbiological and molecular-biological methods. It is an approved lab for water analytics, as well as an approved lab for the diagnostics of the koi herpes virus. The special competence of the company lies in the area of the molecular-biological diagnostics. A focus is the development, validation and distribution of Real-Time PCR-analysis kits. Q-Bioanalytic GmbH is permanently developing new PCR- and real-time PCR-systems. As manufacturer of PCR-kits, Q-Bioanalytic GmbH owns the license for Real-Time PCR for the production and application of the kits in the food area. The analysis kits are traded worldwide by VWR International as a main distributor or can be directly bought from our online store. Q-Bioanalytic GmbH has profound knowledge in dealing with difficult food and feed matrices, different DNA-extraction methods as well as the PCR-analysis. Beside the kit production Q-Bioanalytic GmbH runs an ISO 17025 accredited service lab for food and water analytics with main focus on the PCR-analysis. Furthermore, Q-Bioanalytic is involved in international research projects on food analytics. Development and validation of new qualitative and quantitative real time PCR-systems for the analysis of human-pathogens in food are one object of these projects. Q-Bioanalytic closely co-operates with national market leaders for fish and seafood.